In Resilience for All, Barbara Brown Wilson looks at less conventional, but often more effective methods to make communities more resilient. She takes an in-depth look at what equitable, positive change through community-driven design looks like in four communities—East Biloxi, Mississippi; the Lower East Side of Manhattan; the Denby neighborhood in Detroit, Michigan; and the Cully neighborhood in Portland, Oregon. These vulnerable communities have prevailed in spite of serious urban stressors such as climate change, gentrification, and disinvestment. Wilson looks at how the lessons in the case studies and other examples might more broadly inform future practice. She shows how community-driven design projects in underserved neighborhoods can not only change the built world, but also provide opportunities for residents to build their own capacities. "Resilience for All is a useful handbook for landscape architects wondering how their skill sets might apply to community-led planning and design. It demonstrates how landscapes can be a powerful resource for vulnerable communities. And it also shows how communities can positively impact landscapes." "Millions of people live in cities but have no say in how they evolve. This results in distortions of the democratic process, which we might call 'planning gerrymandering,' and dysfunctional cities. Resilience for All reports on efforts from around the United States to open up the process, to get the people's voices heard, their power awakened, so that our urbanizing nation can be a healthy one. A great guide for everyone who wants to know the process of better city-making." Mindy Thompson Fullilove, MD, Honorary AIA, author of "Urban Alchemy: Restoring Joy in America's Sorted-Out Cities"
"This timely book provides the essential documented pathways for dealing with communities of color and distress. In the past, we have spent hours engaging residents at community meetings and invited professional voices to assist us. We assumed we were empowering the community's voice and vision. Resilience for All demonstrates that addressing residents is an initial step, but fully empowering them as the agent of change is the pathway to success." "This book should be required reading for architects, planners, and anyone else working on complex urban challenges. Resilience for All skillfully presents the structural inequities that are the context for public interest design, and offers practical case studies that confront traditional notions of community engagement and the role of the designer. Dr. Wilson connects the dots between systems-level oppression and on-the-ground design interventions that bring new insights and useful methods to today's conversation about equity and ecology in cities. If you read anything about resilience this year, read this book!" Chapter 1: Introduction: Resilience or Resistance? Come celebrate the launch of the book Resilience for All: Striving for Equity through Community-Driven Design (Island Press, 2018) where author Barbara Brown Wilson will moderate a panel with leaders from the Paths to Pier 42 project in the Lower East Side. Panelists include Damaris Reyes from GOLES, Trever Holland from TUFF LES, Kay Takeda from LMCC, Artist Sonia Louise Davis, Designer Dylan House, and Shawn Watts from the Leroy Street Studio. Join Island Press and Busboys and Poets for a book talk and signing with Resilience for All author Barbara Brown Wilson. In many vulnerable neighborhoods, structural racism and classism prevent residents from having a seat at the table when decisions are made about their community. In an effort to overcome power imbalances and ensure local knowledge informs decision-making, a new approach to community engagement is essential. 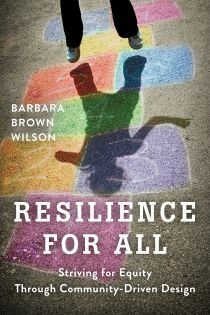 In Resilience for All, Barbara Brown Wilson provides the tools and inspiration needed to do so, and charts a path forward that is driven by social equity, vibrancy, and hope. This event will highlight how community-driven design projects in underserved communities can not only change the built world, but also provide opportunities for residents to build their own capacities. In the United States, people of color are disproportionally more likely to live in environments with poor air quality, in close proximity to toxic waste, and in locations more vulnerable to climate change and extreme weather events. Further, residents with low socio-economic status are often displaced from their neighborhoods as they improve. In many vulnerable neighborhoods, structural racism and classism prevent residents from having a seat at the table when decisions are made about their community. In an effort to overcome power imbalances and ensure local knowledge informs decision-making, a new approach to community engagement is essential. In this webinar, author Barbara Brown Wilson of Resilience for All: Striving for Equity Through Community-Driven Design (Island Press, 2018) will be joined by Sunshine Mathon and Claudette Grant (Executive Director and Community Organizer at Piedmont Housing Alliance) to talk through how community-driven design differs from traditional planning practice, and how it is happening in the redevelopment of Friendship Court in Charlottesville, VA.
Join us for a live webinar with Barbara Brown Wilson, professor and author of Resilience for All, and ioby project leaders Jared Myers and Samoy Smith as we discuss how grassroots design can strengthen your community project. We’ll learn how successful project leaders created, designed, and implemented projects that transformed their neighborhoods, and explore how input from a diverse range of community residents uncovered new solutions, and ensured the sustainability of their projects. Our built and social environments are inherently influenced by decisions made by the power holders in our communities often leading to disparate impacts on our most vulnerable neighbors. Socioeconomically vulnerable communities around the country are developing their own, increasingly sophisticated, methods for influencing local decision making, often with designers serving as resource allies. This event explores what it means to be a resilient community, how resilience often means disruption of existing power structures, and how design professionals can be allies in building a more just and resilient environment for all. Together we will examine local and national examples of community resilience building and place our own design disciplines within these contexts as potential allies. The objective of this event is to further discourse on design tools and processes that address complex urban problems through collaboration guided by local knowledge and how they apply to the daily practice of a variety of design disciplines. Barbara Brown Wilson’s research and teaching focus on the history, theory, ethics, and practice of sustainable community design and development, and on the role of urban social movements in the built world. Dr. Wilson writes for both academic and mainstream audiences, and is the author of Resilience for All: Striving for Equity through Community-Driven Design (Island Press: 2018), and co-author of Questioning Architectural Judgement: The Problem of Codes in the United States (Routledge: 2013). Her research is often change-oriented, meaning she collaborates with community partners to identify opportunities for engaged and integrated sustainable community development that creates knowledge to serve both local and educational communities. Nicole Joslin has a diverse professional and academic background in architecture, development, disaster recovery, and community engagement. Nicole teaches in the Public Interest Design program at the University of Texas and serves as the Executive Director of the Austin Community Design and Development Center, which works to improve the quality of life for all through community-engaged design. Nicole is also chair of the Austin Housing Coalition and board member of Evolve Austin Partners, two coalitions of affordable housing providers and grassroots organizations supporting the development of an affordable, mobile, and sustainable Austin. Carrie Waller, an Associate at Gensler Austin, works as a Project Architect and technical designer at a variety of project scales. Carrie has a passion for community-building and housing affordability: she recently led her office in an exploratory design competition to develop urban-focused permanent supportive housing solutions specific to Austin. Currently serving as co-chair of Austin’s AIA DesignVoice committee, she's led events and dialogue related to missing middle housing and density in the state capitol, and has gained experience in qualitative post-occupancy analysis. Carrie completed her M.Arch at UT Austin after transitioning from a career in classical music. The Austin Community Design and Development Center is a 501(c)3 organization that creates affordable living opportunities through community-engaged design. We envision inclusive and sustainable neighborhoods achieved through an empowered community, a nurturing built environment, and supportive policy and regulation. Our staff of architects and planners collaborate with community members and the organizations that serve them to build inclusive systems of engagement and design sustainable communities. DesignVoice is a committee of the AIA Austin Chapter which facilitates opportunities for design professionals to serve their community through collaborative design focused events and informational programs. Click here to download the presentation that accompanies the book or view it below. A Changing Climate Means A Changing Society. The Island Press Urban Resilience Project, Supported By The Kresge Foundation And The JPB Foundation, Is Committed To A Greener, Fairer Future.​ This Article Was Originally Published October 12, 2018 In CoLab Radio. "The word empower, I truly hate it. No one can empower you. We have the power already. It’s just about utilizing the power, and I think in the City of Detroit, the people have been so misled that they no longer think they have this power to really move the city forward. A lot of the work that we have done at this table, in certain communities, we have reenergized that power with the residents. And that is what it’s about— reenergizing the power residents already have." The visioning process produced a 50-year framework—Detroit Future City—driven by a cohort of resident leaders known collectively as Impact Detroit. After the framework was finalized, this group launched a series of pilot projects across the city to actively engage residents in the physical manifestation of that future. The first such project—the Skinner Playfield Project and its corresponding Safe Routes to School Initiative in the Denby neighborhood—is a story of incredible collaboration, of grassroots youth leadership, and of hope. Denby’s mostly residential streets are lined with beautiful bungalow-style homes, but vacancy now also marks those homes. Northeast Detroit leads the City in foreclosures—with over 12,000 households losing their homes since 2008 through mortgage or tax foreclosures in the 48205 zipcode, which encapsulates most of Denby. Imagine being one of Denby’s more than 6,200 children, trying to walk to school in one of the most crime-ridden neighborhoods in the country. The foreclosure rate within a quarter-mile of Denby High School is 16.66%, meaning every sixth house is likely covered in vines, boarded up, marked in spray-paint with a large X to note its abandonment, and potentially housing nefarious activities. It is no surprise, then, that when Denby youth were asked what they cared most about in the community, the most popular subject of interest was crime and the second was land use.